This narrow coastal strip of indigenous forest in the Southern Cape, was the main source of income for generations of woodcutters, Knysna being the principal town as far as the timber industry was concerned. Until well into the 20th century the entire economic life and structure of Knysna revolved around the timber trade. 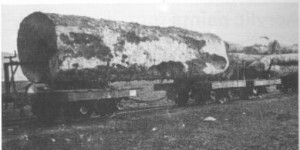 and gold on the Reef as well as the expansion of the railway network acted as a further powerful stimulus since timber from the George-Knysna area was used for mining props and railway sleepers. 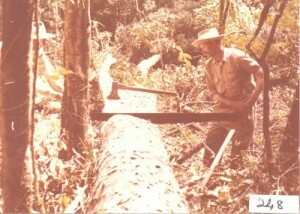 The timber trade was intimately connected with the general growth of the South African economy, and the 20th century industrial expansion of the country ensured an increasing market for timber. Many of the newcomers to the area were evicted ‘bywoners’ from the arid Karoo districts. These districts experienced a severe economic crisis after the ostrich feather slump of 1913-14 and a crippling drought in 1916. 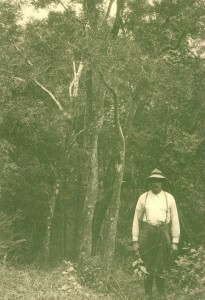 The forest and coastal belt was a haven for such ‘poor whites’ from the Karoo. 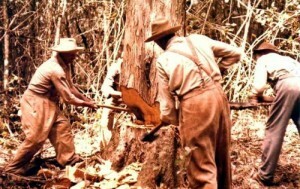 The forestry settlements were started during and shortly after the First World War as relief schemes for the urban unemployed and the rural casualties of drought. The majority of ‘poor whites’ in the area found themselves outside the plantation settlements. 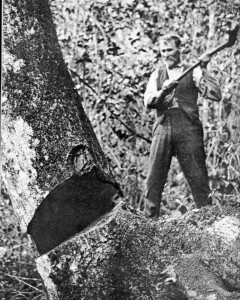 They constituted the bulk of the woodcutting population and were largely dependant on the indigenous forests for their livelihood. 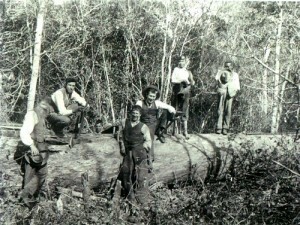 Many of them viewed the forests as a providential gift “God het ons arm mense die houtjies gegee”, one woodcutter expressed this general sentiment. However, the work the woodcutters performed and the conditions under which they toiled were most arduous. After his spell in the forest, the woodcutter came home to little more than a corrugated iron or wooden shack, consisting of two rooms with a clay floor and a kitchen. His often large family meant overcrowded living conditions, lack of hygiene and often insufficient food. In general the woodcutter families lived an isolated and insular life, cut off from ‘civilising’ influences and attached to the forests and their particular life-style. The woodcutters were self-employed, willing and able to work, but often lacked the necessary capital, training and most important, the opportunity to benefit from their labours. 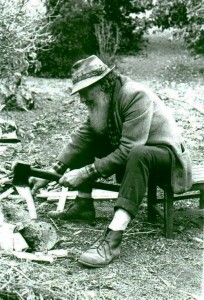 In trying to account for the poverty of the woodcutter population, it is not they could not adapt themselves to a ‘modern economy.’ On the contrary, the impact of merchant capital in the area, had more to do with the poverty of the woodcutters than their presumed ‘backwardness’ and ‘laziness’. By far the most prominent amongst the timber merchants was the firm of Thesen and Company. The Thesen family came to South Africa in 1869 from Stavanger in Norway while en route to New Zealand. In Cape Town, they came into contact with the Swedish-Norwegian consul and merchant, C.A. Akerberg, who informed them about the shortage of ships along the South African coast. Akerberg put Arnt Thesen in touch with some Cape merchants who wanted cargoes delivered along the coast, including the port of Knysna. Knysna, reminiscent of Norway, at the time a small town of approximately 200 whites, appealed to the Thesens. But more importantly, the economic potential of the large forests close by attracted them and in April 1870 the family decided to settle in Knysna. 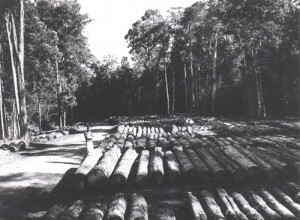 purchased, large tracts of land suitable for farming and tree-planting were acquired, and a short railway line into the Knysna forests for the transportation of timber was built. Charles Thesen also extended his influence in other directions and under his direction and through his combination of extensive interests with an array of public positions, the company became a powerful and dominating force in the region. the expense of the woodcutter population as very little of this money found its way into their pockets – the timber merchants and other middle-men were by far the main beneficiaries. Despite the debilitating effect of merchant capital on the woodcutter population, the woodcutters still preferred to continue work in their beloved forests with a very small income – but as independent operators. ‘Forest workers love the forest and are proud of the fact that they are not daily-paid men. That is the one thing which still makes them strong in the midst of poverty,’ A.J. Werth stated in 1939. 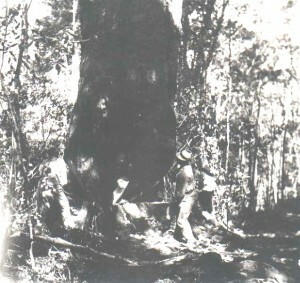 Throughout the four decades under review the Department of Forestry which was responsible for the conservation of the area, exerted considerable pressure to displace the woodcutters, claiming that the forests were incapable of supporting the number of woodcutters and that their uneconomical methods rapidly depleted the indigenous forests. 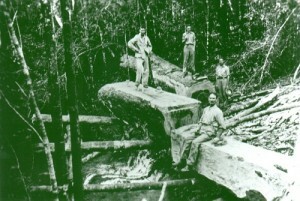 In 1913 the state sought to regulate the situation through an official Forest Act. One of the clauses determined that all woodcutters had to be registered and that no new names could be added after the initial registration. 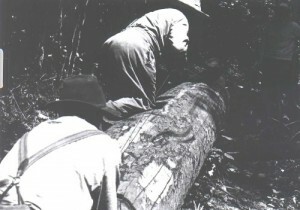 Since the number of people on the list declined annually and additional registrations were disallowed, the registration clause marked the beginning of the end for the woodcutter population working in the indigenous forests. the final analysis, despite the resilience of the woodcutters, largely determined what could be achieved and steadily eroded whatever independence they might have possessed. Indeed, ‘God might have given the poor the wood,’ but it was also a gift which others coveted and acquired at the expense of the poor.